News: Not Your Father’s Shop | Temco Tool Inc.
At Temco Tool, we pride ourselves in our state of the art 28,000 sq. ft. machining facility where not only do we have some of the most advanced CNC equipment on the market, but provide an excellent work environment for our employees. Over the years we have developed our production area into a modern, clean, worker friendly shop environment. We believe that the quality of the work environment is reflected in the workmanship and quality of parts machined. 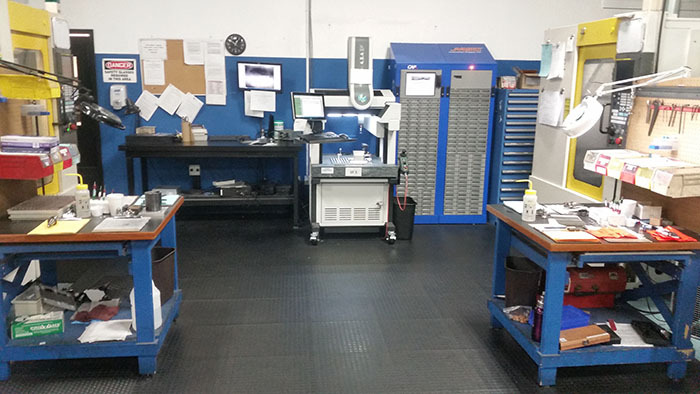 With the latest equipment and a clean, modern, technology driven production floor, Temco Tool is truly not "your father’s shop". Over the years, our shop has continued to grow, both in capability, and capacity. Our 3 through 9-axis machining, wire, RAM and small hole EDM as well as our turning capabilities have continued to stay on the leading edge of the industry. We excel with manufacturing small, intricate components with tight tolerances and challenging geometry. Purchases in the last year have grown our 5 axis and QA capacity to new levels. Maintaining a constant temperature and excellent air quality is vital to produce high quality parts. Any drastic changes in temperature can have adverse affects on machine and part tolerances. The environment, as well as process equipment, are temperature controlled to allow Temco to maintain the most demanding tolerances. This ensures not only a pleasant workplace for the employee, but a dimensionally stabile environment. The entire production floor is equipped with composite rubber flooring, manufactured from reclaimed material. Not only is it eco-friendly but it also reduces fatigue caused from standing on hard, cold cement floors. A well-lit work floor is vital to our shop’s success. In order to operate machinery effectively and provide a safe work environment, we have installed state of the art, energy efficient LED lightening in our facility’s shop. Our lighting provides a high quality light to support production activities. In order to maintain our shop’s quality work environment, we are continuously updating infrastructure systems. These systems include not only lighting and flooring, but comprise additional systems such as compressed air systems and information technologies. In the past year substantial updates to our information technologies has allowed a significant update to our ERP system as well as the introduction of tablet based wireless transactions on the production floor. Stay tuned for another post discussing new technologies we are implementing in our facility to improve efficiency.